Member states and regions of the Nordic Council (blue). The Nordic Council is the official body for formal inter-parliamentary co-operation among the Nordic countries. Formed in 1952, it has 87 representatives from Denmark, Finland, Iceland, Norway, and Sweden as well as from the autonomous areas of the Faroe Islands, Greenland, and the Åland Islands. The representatives are members of parliament in their respective countries or areas and are elected by those parliaments. The Council holds ordinary sessions each year in October/November and usually one extra session per year with a specific theme. In 1971, the Nordic Council of Ministers, an intergovernmental forum, was established to complement the Council. The official and working languages of both the Nordic Council and the Nordic Council of Ministers are Danish, Norwegian, and Swedish, which comprise the first language of around 80% of the region's population and learned as a foreign language by the remaining 20%. The Nordic Council and the Nordic Council of Ministers are involved in various forms of cooperation with neighbouring areas, amongst them being the Baltic Assembly and the Benelux, as well as Russia and Schleswig-Holstein. During World War II, Denmark and Norway were occupied by Germany; Finland was under assault by the Soviet Union; while Sweden, though neutral, still felt the war's effects. Following the war, the Nordic countries pursued the idea of a Scandinavian defence union to ensure their mutual defence. However, Finland, due to its Paasikivi-Kekkonen policy of neutrality and FCMA treaty with the USSR, could not participate. It was proposed that the Nordic countries would unify their foreign policy and defence, remain neutral in the event of a conflict and not ally with NATO, which some were planning at the time. The United States, keen on getting access to bases in Scandinavia and believing the Nordic countries incapable of defending themselves, stated it would not ensure military support for Scandinavia if they did not join NATO. As Denmark and Norway sought US aid for their post-war reconstruction, the project collapsed, with Denmark, Norway and Iceland joining NATO. Further Nordic co-operation, such as an economic customs union, also failed. This led Danish Prime Minister Hans Hedtoft to propose, in 1951, a consultative inter-parliamentary body. This proposal was agreed by Denmark, Iceland, Norway, and Sweden in 1952. The Council's first session was held in the Danish Parliament on 13 February 1953 and it elected Hans Hedtoft as its president. When Finnish-Soviet relations thawed following the death of Joseph Stalin, Finland joined the council in 1955. On 2 July 1954, the Nordic labour market was created and in 1958, building upon a 1952 passport-free travel area, the Nordic Passport Union was created. These two measures helped ensure Nordic citizens' free movement around the area. A Nordic Convention on Social Security was implemented in 1955. There were also plans for a single market but they were abandoned in 1959 shortly before Denmark, Norway, and Sweden joined the European Free Trade Area (EFTA). Finland became an associated member of EFTA in 1961 and Denmark and Norway applied to join the European Economic Community (EEC). This move towards the EEC led to desire for a formal Nordic treaty. The Treaty of Helsinki outlined the workings of the Council and came into force on 24 March 1962. Further advancements on Nordic cooperation were made in the following years: a Nordic School of Public Health, a Nordic Cultural Fund, and Nordic House in Reykjavík were created. Danish Prime Minister Hilmar Baunsgaard proposed full economic cooperation ("Nordek") in 1968. Nordek was agreed in 1970, but Finland then backtracked, stating that its ties with the Soviet Union meant it could not form close economic ties with potential members of the EEC (Denmark and Norway). Nordek was then abandoned. As a consequence, Denmark and Norway applied to join the EEC and the Nordic Council of Ministers was set up in 1971 to ensure continued Nordic cooperation. In 1970 representatives of the Faroe Islands and Åland were allowed to take part in the Nordic Council as part of the Danish and Finnish delegations. Norway turned down EEC membership in 1972 while Denmark acted as a bridge builder between the EEC and the Nordics. Also in 1973, although it did not opt for full membership of the EEC, Finland negotiated a free trade treaty with the EEC that in practice removed customs duties from 1977 on, although there were transition periods up to 1985 for some products. Sweden did not apply due to its non-alliance policy, which was aimed at preserving neutrality. Greenland subsequently left the EEC and has since sought a more active role in circumpolar affairs. In the 1970s, the Nordic Council founded the Nordic Industrial Fund, Nordtest and the Nordic Investment Bank. The Council's remit was also expanded to include environmental protection and, in order to clean up the pollution in the Baltic Sea and the North Atlantic, a joint energy network was established. The Nordic Science Policy Council was set up in 1983 and, in 1984, representatives from Greenland were allowed to join the Danish delegation. Following the collapse of the Soviet Union in 1991, the Nordic Council began to cooperate more with the Baltic states and new Baltic Sea organisations. Sweden and Finland joined the European Union (EU), the EEC's successor, in 1995. Norway had also applied, but once again voted against membership. However, Norway and Iceland did join the European Economic Area (EEA) which integrated them economically with the EU. The Nordic Passport Union was also subsumed into the EU's Schengen Area in 1996. The Nordic Council became more outward-looking, to the Arctic, Baltic, Europe, and Canada. The Øresund Bridge linking Sweden and Denmark led to a large amount of cross-border travel, which in turn led to further efforts to reduce barriers. However, the initially envisioned tasks and functions of the Nordic Council have become partially dormant due to the significant overlap with the EU and EEA. In 2008 Iceland began EU membership talks, but decided to annul these in 2015. The Nordic Council and the Nordic Council of Ministers have a particular focus on strengthening the Nordic language community; the main focus of their work to promote language understanding in the Nordic countries is on children and young people's understanding of written and oral Danish, Norwegian, and Swedish, the three mutually intelligible Scandinavian languages. Representatives of the Council have the ability to issue proposals in their own languages, and official documents are translated to cater to all five of the major Nordic languages. Discussions for bringing Finnish and Icelandic into equal footing with the three other languages has been proposed. The Nordic Council consists of 87 representatives, elected from its members' parliaments and reflecting the relative representation of the political parties in those parliaments. It holds its main session in the autumn, while a so-called "theme session" is arranged in the spring. Each of the national delegations has its own secretariat in the national parliament. The autonomous territories – Greenland, the Faroe Islands and Åland – also have Nordic secretariats. 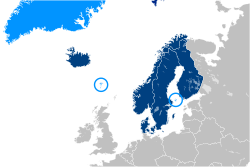 The Nordic Council uses the three Continental Scandinavian languages (Danish, Norwegian, and Swedish) as its official working languages, but also publishes material in Finnish, Icelandic, and English for information purposes. The council refers to Danish, Norwegian, and Swedish collectively as Scandinavian and considers them to be different forms of the same language forming a common language community. Since 1987, under the Nordic Language Convention, citizens of the Nordic countries have the opportunity to use their native language when interacting with official bodies in other Nordic countries without being liable to any interpretation or translation costs. The Convention covers visits to hospitals, job centres, the police and social security offices. The languages included are Swedish, Danish, Norwegian, Finnish, and Icelandic. The Council does not have any formal power on its own, but each government has to implement any decisions through its national legislature. With Denmark, Norway, and Iceland being members of NATO and Finland and Sweden being neutral, the Nordic Council has not been involved in any military cooperation. The original Nordic Council concentrates on inter-parliamentary cooperation. The Nordic Council of Ministers, founded in 1971, is responsible for inter-governmental cooperation. Prime Ministers have ultimate responsibility but this is usually delegated to the Minister for Nordic Cooperation and the Nordic Committee for Co-operation, which co-ordinates the day-to-day work. The autonomous territories have the same representation as states. The Nordic Council and the Council of Ministers have their headquarters in Copenhagen and various installations in each separate country, as well as many offices in neighbouring countries. The headquarters are located at Ved Stranden No. 18, close to Slotsholmen. The Nordic Council has 8 members, 5 sovereign states and 3 self-governing regions. In accordance with § 13 of the Rules of Procedure for the Nordic Council the Sámi Parliamentary Council is the only institution with observer status with the Nordic Council. In accordance with § 14, the Nordic Youth Council has the status of "guest" on a permanent basis, and the Presidium "may invite representatives of popularly elected bodies and other persons to a session and grant them speaking rights" as guests. According to the council, "within the last couple of years, guests from other international and Nordic organisations have been able to take part in the debates at the Sessions. Visitors from the Baltic States and Northwest Russia are those who mostly take up this opportunity. Guests who have a connection to the theme under discussion are invited to the Theme Session." The Nordic Council of Ministers has established four Offices outside the Nordic Region, namely in all the Baltic states – Estonia, Latvia and Lithuania – and the German state of Schleswig-Holstein. The offices form part of the secretariat of the Nordic Council of Ministers; according to the Council of Ministers their primary mission is to promote cooperation between the Nordic countries and the Baltic states and to promote the Nordic countries in cooperation with their embassies within the Baltic states. The Nordic Council and the Council of Ministers define Estonia, Latvia, Lithuania and Russia as "Adjacent Areas" and has formal cooperation with them under the Adjacent Areas policies framework; in recent years the cooperation has focused increasingly on Russia. The Nordic Council had historically been a strong supporter of Baltic independence from the Soviet Union. During the move towards independence in the Baltic States in 1991, Denmark and Iceland pressed for the Observer Status in the Nordic Council for the then-nonsovereign Estonia, Latvia and Lithuania. The move in 1991 was opposed by Norway and Finland. The move was heavily opposed by the Soviet Union, accusing the Nordic Council of getting involved in its internal affairs. In the same year, the Nordic Council refused to give observer status for the three, at the time nonsovereign, Baltic states. While the Nordic Council rejected the Baltic states' application for formal observer status, the council nevertheless has extensive cooperation on different levels with all neighbouring countries, including the Baltic states and Germany, especially the state of Schleswig-Holstein. Representatives of Schleswig-Holstein were present as informal guests during a session for the first time in 2016. The state has historical ties to Denmark and cross-border cooperation with Denmark and has a Danish minority population. As parliamentary representatives from Schleswig-Holstein, a member of the South Schleswig Voter Federation and a member of the Social Democrats with ties to the Danish minority were elected. The Sámi political structures long desired formal representation in the Nordic Council's structures, and were eventually granted observer status through the Sámi Parliamentary Council. In addition, representatives of the Sámi people are de facto included in activities touching upon their interests. In addition, the Faroe Islands have expressed their wishes for full membership in the Nordic Council instead of the current associate membership. Three of the members of the Nordic Council (Sweden, Denmark and Finland, all EU-member states), the Baltic Assembly and the Benelux sought intensifying cooperation in the Digital Single Market, as well as discussing social matters, the Economic and Monetary Union of the European Union, the European migrant crisis and defense cooperation. Relations with Russia, Turkey and the United Kingdom was also on the agenda. Some desire the Nordic Council's promotion of Nordic cooperation to go much further than at present. If the states of Iceland, Sweden, Norway, Denmark and Finland were to merge in such an integration as some desire, it would command a gross domestic product of US$1.60 trillion, making it the twelfth largest economy in the world, larger than that of Australia, Spain, Mexico or South Korea. Gunnar Wetterberg, a Swedish historian and economist, wrote a book entered into the Nordic Council's year book that proposes the creation of a Nordic Federation from the Council in a few decades. ^ "Language". 6 August 2008. Retrieved 1 June 2018. ^ ERR (22 June 2017). "Ratas meets with Benelux, Nordic, Baltic leaders in the Hague". ERR. Retrieved 1 June 2018. ^ Offices outside the Nordic Region. Nordic Council of Ministers. ^ The plan for a Scandinavian Defence Union, European Navigator. Étienne Deschamps. Translated by the CVCE. ^ "Further Icelandic support for EU membership | IceNews – Daily News". Icenews.is. 3 November 2008. Retrieved 11 July 2009. ^ "Suomen ja islannin kielen asemaa parannetaan pohjoismaisessa yhteistyössä" (in Finnish). 2 November 2017. Retrieved 1 June 2018. This page was last edited on 19 March 2019, at 11:33 (UTC).